How well open studios work for you seems to depend on a number of factors—professionalism and organizational savvy, marketing, and location. 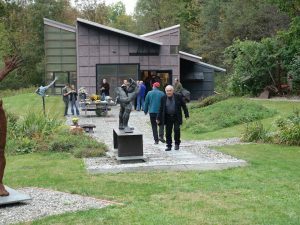 But even a studio way out in the boonies can become part of an annual event that benefits both artists and the community in unexpected ways. They have since brought in a consultant named Sue Sanderson, who has an expertise in development and “totally knew how to run an event,” says Parke. “We worked on trying to brand the tour as a quality destination. Sue and her wife go around and look at all the studios—are there places to park? Is the studio neat? Is everything priced? “We had a lot of requirements,” continues Parke. “You had to have a tax number. You can’t undercut your dealers if they send clients your way. We wanted to develop an audience for us—not the prosaic Sunday plein-air painter—so artists have to go through a few hoops to be on the tour,” one of which is admission by jury. 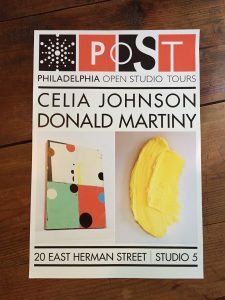 When Celia Johnson and Don Martiny participated in Philadelphia Open Studios (POST) IN 2011, they lived in a building occupied by many other artists. “We had a big open space, 1,000 square feet, with beautiful white walls, and we cleaned it up so that it looked very much like an art-gallery space,” says Johnson. Kylie Heidenheimer, whose studio is at The Clemente, a cultural center in a former school building on the Lower East Side of Manhattan, says the role of open studios is in flux. 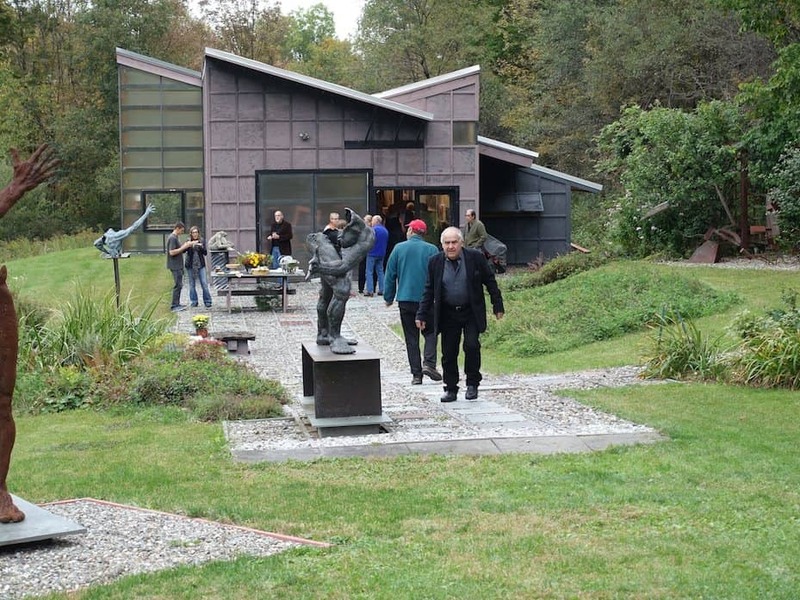 “With real estate shaping where and how art is being shown, open studios may be increasingly important for both artists and their public,” she notes. “For artists between shows or without representation, they may also serve as structure and a deadline. 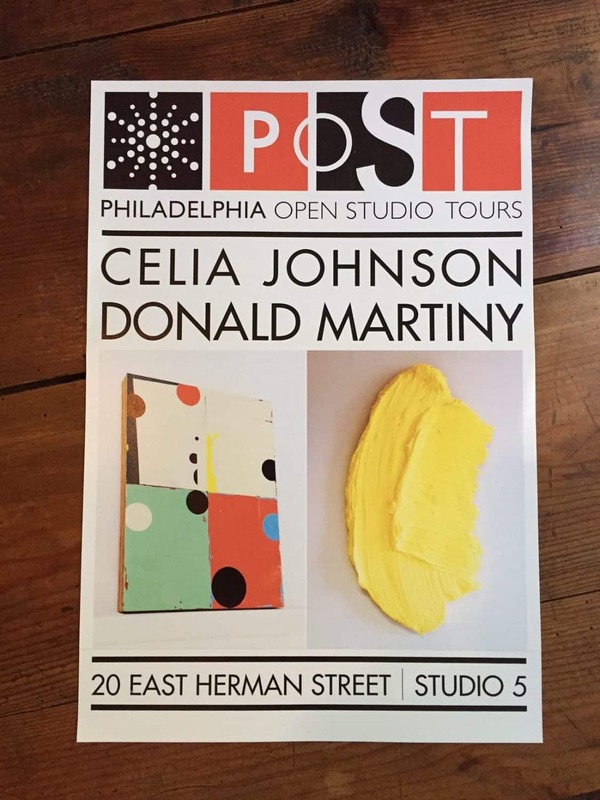 The Clemente and its resident organization, Artists Alliance, have continued to expand the annual open studios, Heidenheimer says, With galleries and exhibition venues making the LES a big draw, the Clemente is taking out ads (one in Hyperallergic, for instance), adding events by performing arts organizations on the premises, inviting guest artists, and putting up quality signage for navigating the approximately 80,000 square feet of its 19th-century building. “The spaces are amazing, beautifully maintained, and the building’s not going to turn into condos anytime soon,” says Shalom. Twice a year Mana hosts open studios, usually in October and May, and these are coordinated with shows in the building’s gallery spaces. “We’ve had a show of John Chamberlain’s works, performances, and there’s a resident dance company. 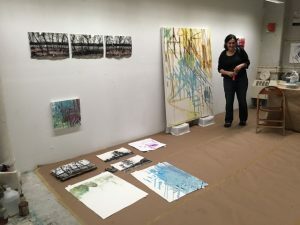 The open studios are from one to six, and you get thousands of people coming through.” Plus there’s a shuttle bus that runs from Manhattan to the Mana Complex in Jersey City. Angela White is also part of a big studio building in an art center called Artists and Makers in Bethesda, MD. “We do a First Friday every month, and there are 100 artists participating. Bethesda Magazine picks it up, and we get a really big crowd, often with curators and collectors coming through. “I’ve learned a lot since I’ve been here,” she continues. 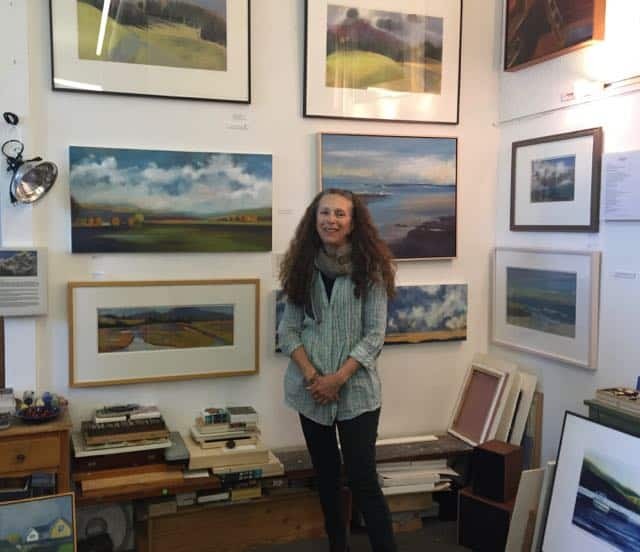 “I was too shy to put up prices, so now I’ve made up a price list and I have that on the wall for some of the work, and I also make an artist’s statement available. I have flyers made up to promote workshops and demonstrations. If I have work in progress, I have my materials out for people to see.” She may vary her goal from month to month. “If my goal that month is to promote workshops, then I might have demonstrations in progress. 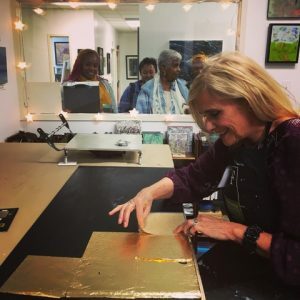 If I’m working on paintings, I’ll have a flyer for people who want to sign up for private lessons.” Because of the First Fridays, she adds that she’s been invited to participate in group shows. If you are affiliated with a gallery, make sure to come to some understanding about sales, especially if the dealer sends people your way. If you are organizing studio tours far from a centralized location, consider hiring a marketing specialist or professional events planner to help with details. Haggling is probably unavoidable, but try not to undersell yourself. “My line is, When I have free health care, you can get a discount,” says Parke. Offer the option of taking a work home on approval. “I try that more with people I know and trust,” says Goldberg. Thanks for the article Ann and to all who contributed! Enjoyed hearing about the variety of types of Open Studio events. Loved hearing about the entreprenurial artists in upstate NY getting organized with a consultant, website and marketing plan, etc. for their tours. I never really liked going to Open Studios anywhere…..Always seemed like such a sad event as artists sat in the corner of a studio waiting for SOME THING to happen….By 2004 I had moved to Boston- the Jamaica Plain neighborhood… I rented a great space in a small building that housed about 20-25 studios and was actually a real nice group of working artists….My first year there I decided to participate in this neighborhood art-event—this is the first time ever to participate in an Open Studio….. Doing this accomplishes a few things: First and foremost it was FUN….plus my building was guaranteed to have at least 50 + interested people wandering through the studios all at once….other artists benefitted from having dozens of people see their work. They sold work to my friends. I met every artist in the building cause they all got hungry and wanted a beer. After a few years of throwing my party – a few other artists began putting out food—we quickly became one the best known artist buildings in the neighborhood….It was a gas….another perk is that all the leftovers can be eaten on Sunday as people stroll through your studio….they will linger with you….lots of chatting and good stuff happens…. So that’s my suggestion! Throw a party. Hi, M’Liz: That’s what I’m advising artists to do in Part Two of this report, which will appear on Sunday. I should have talked to you while I was researching! a little more: I have always been one for making sure that when I show art – mine or some one else’s to have a celebration with it! Food/wine/soda’s….. Frankly art by itself (and LOTS of art you see at these open studios) can be a boring affair- or for some intimidating- for other’s its hard to stand around art you basically can’t stand to look at! but? give people some snacks and a little vino and you’d be surprised at some people who open themselves up to looking and talking about art! Can’t wait to read Part 2 of your Open Studio article Ann ! As said, stay tuned for Part Two tomorrow!